Cleatech offers a complete range of essential furniture for your new or existing gowning rooms from Eagle Group. Our Gowning room furniture includes gowning room benches, Gowning racks, and shelving, Cleanroom & Gowning storage cabinets etc. Solid Gowning Benches: Top 14 gauge type 304 stainless steel 9″ and 12″ wide. Legs: 1 5/8″ diameter, 17″ high, 16 gauge type 304 stainless steel. Brush or electropolished finish. Flanged foot plates. 36″ to 84″ length. 90° downturn on each end. Wire Gowning Benches: Top 14″ deep wire bench in 36″ to 72″ length, 62% laminar flow. Leg: 1″ diameter posts, 18″ high. Available in Stainless or Chrome plated. Triangular foot plates mounted to 1″ diameter legs. Electropolished and stainless steel finish gowning bench available on all tops. 18″ wide. 3/4″ perforations on 1″ centers, allowing a 40% laminar flow. Legs: 1″ diameter posts, 18″ high, 16 gauge type 304 stainless steel. Check here for freestanding gowning racks from Eagle. 1 1/2 welded tube frame is shipped knocked-down and bolted together with cross members. Available with non-removable and removable hangers. Nylon dissipative feet standard. Hanger slots are standard on 3″ centers, with other spacing available. We offer Wall Mount Gowning racks from Eagle. They are Ideal for garment storage when floor space is not available. Open-wire construction promotes laminar flow. Mounts easily to wall. Hooks, spaced on 1 1/2″ centers, are staggered vertically for ease of access. All-welded construction. Available in chrome plated steel and electropolished stainless steel finish. 1″ diameter full-length hanger tube, grooved at 1″ increments, is suspended on an underside of wire shelf via two 2-gauge hooks, one on each end. Available in chrome plated and stainless steel finish. Plastic shelf markers available. 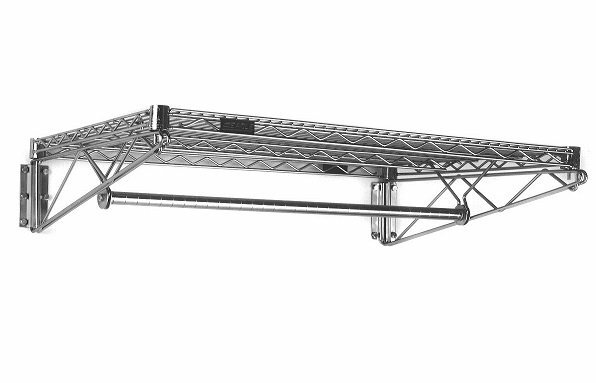 We Offer Eagle Shoe racks, 62% laminar flow through chrome plated or stainless steel wire shelves. 1/4″-diameter rods create partitions for shoe storage. Foot plates included. All stainless steel type 304, 18 gauge enclosed cabinet. Double-pan 20 gauge stainless steel hinged doors. Three and four adjustable shelves on 4″ centers, 24″ deep by 36″ or 48″ long. Available with slanted top for laminar flow.